Well after spending three weeks in Bristol, UK, my time is nearly up. I came to spend time with some colleagues who also do quite a lot of work on sustainable transport issues like cycling, so it’s not surprising that the city has its share of interesting thing cycling-wise on the ground too. However, in one important aspect is it quite different from Christchurch – hills! Yes, Bristol is founded on a series of hills and valleys, making most trips an up and down affair. For something like cycling, this is quite an important consideration; while in Christchurch you may typically use the same (reasonably direct) route in both directions, when in Bristol topography also has to be accounted for. As a result, while I invariably used the Frome Greenway to bike into downtown Bristol, I also found that the Concorde Way was a much better route back to avoid a very steep climb. 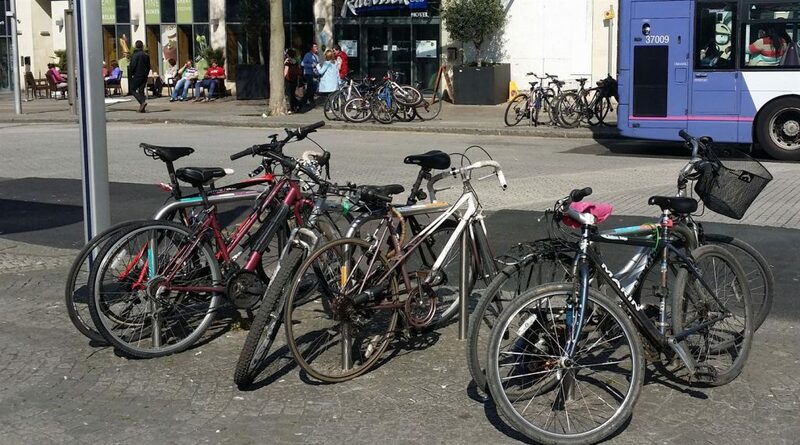 Bristol has historically been a home for cycling advocacy in the UK. Sustrans, developers of thousands of miles of cycle trails across the UK, originated in Bristol and still have a large office there. 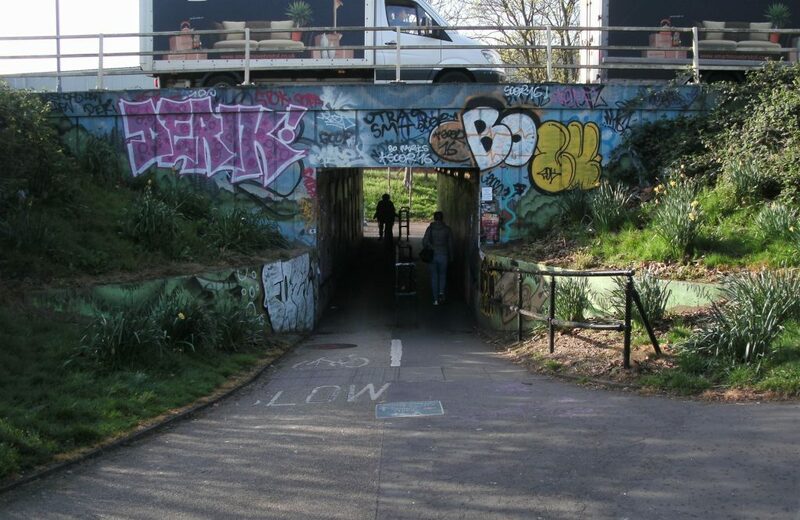 One of Sustrans’ most famous routes, the Bristol-Bath Railway Path, runs through the city along the line of an old railway corridor (complete with tunnel!). 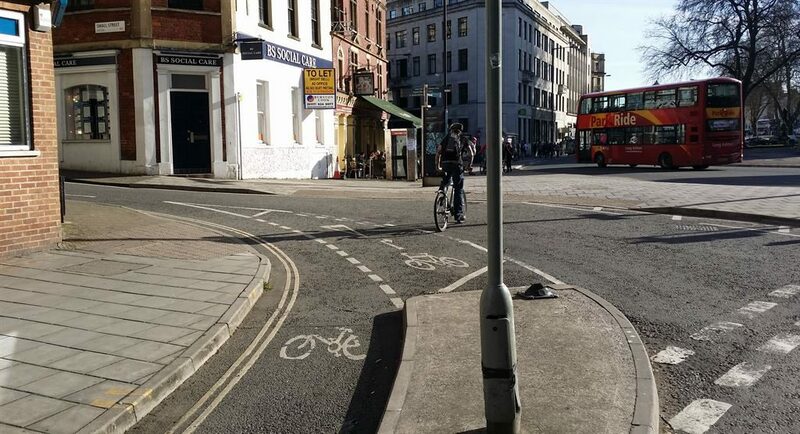 A few years ago, Bristol was appointed one of the country’s cycling demonstration towns (a bit like our Model Communities) and receive considerable funding to improve their cycling provision and promotion. Bristol has also been named the European Green Capital for 2015, a much sought after honour reflecting amongst other things their commitment to sustainable transport. 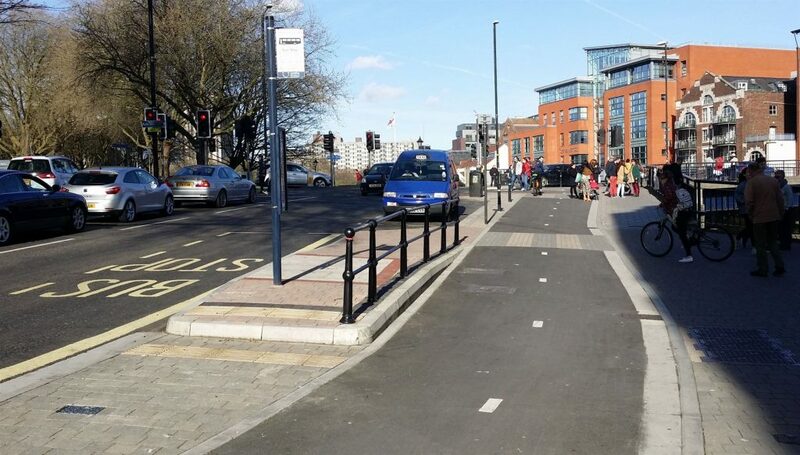 Bristol makes a lot of use of shared pathways, both alongside and away from roads. Almost from the moment I first arrived at the Bristol Parkway train station, I was following a series of (well-signed) shared pathways that led me to my accommodation. Sometimes they appear to be just ordinary footpaths re-branded, other times they appear to have had at least some additional width added to them, and maybe some work done to road crossings. 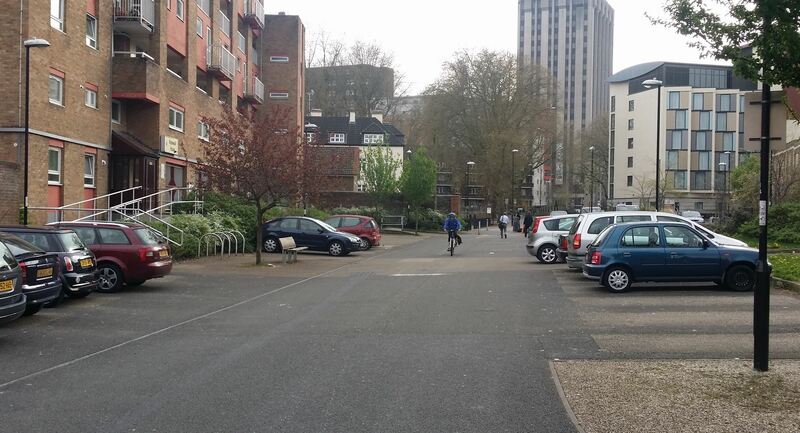 Often there is a line down the middle supposedly separating pedestrians from cycles; in practice this was not often wide enough when encountering someone “of your own kind” coming the other way and so the lines tend to be ignored more often than not. Does it make sense to put a dividing line down a path like this? One thing I find that happens as a result of these pathways is that, even on the bits that are probably technically not shared path (and sometimes I didn’t know), you find yourself riding on them anyway. It just ends up being less hassle than jumping on and off the road as required (except downtown where the pedestrian numbers can be offputting). You do have to watch out when crossing side roads however; relatively few paths have some kind of priority or raised crossing. Evidently the law over here is also similarly muddled as NZ about cyclists using zebra crossings but cars are pretty good at letting you ride over them anyway. One annoying feature of pathways crossing busy roads is the long delays due to the traffic signals. Not only do you often have to wait a long time to get your crossing phase, but that will only take you across one carriageway and then you have to repeat the process by pushing another “beg button”. 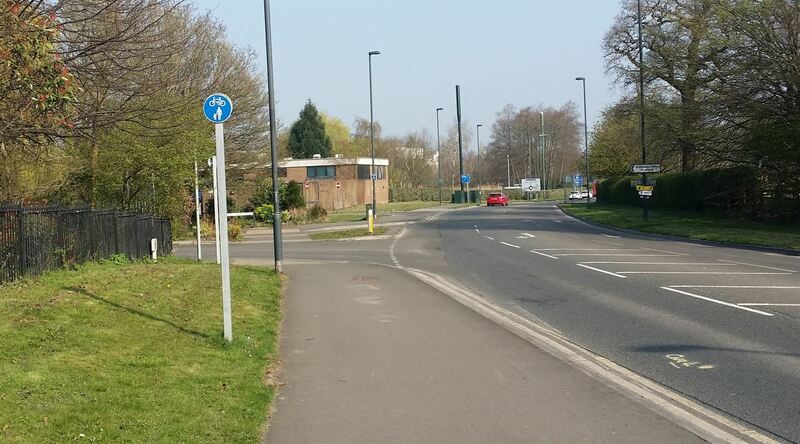 For a major road with dual carriageway and slip lanes, that could be up to four separate crossings. Not surprisingly, many people tend to look for gaps in the traffic and cross anyway. 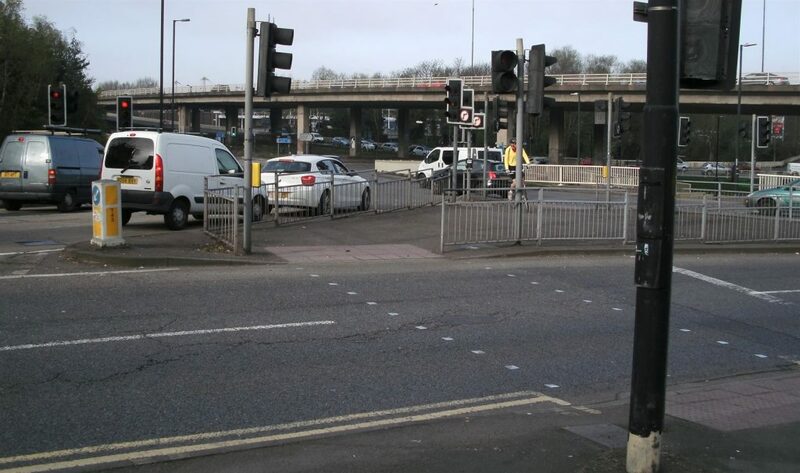 At some of the busier intersections (often signalised roundabouts) an attempt has been made to make it easier for pedestrians/cyclists to get through by linking via underpasses to a common area in the middle of the junction. Most of these were built decades ago however and are not great in terms of width, sight-lines, directness, or personal security. So it can be a toss-up between the lesser of the two evils – signals or underpasses. Sure, better than nothing, but it highlights the need to “do it right” the first time. 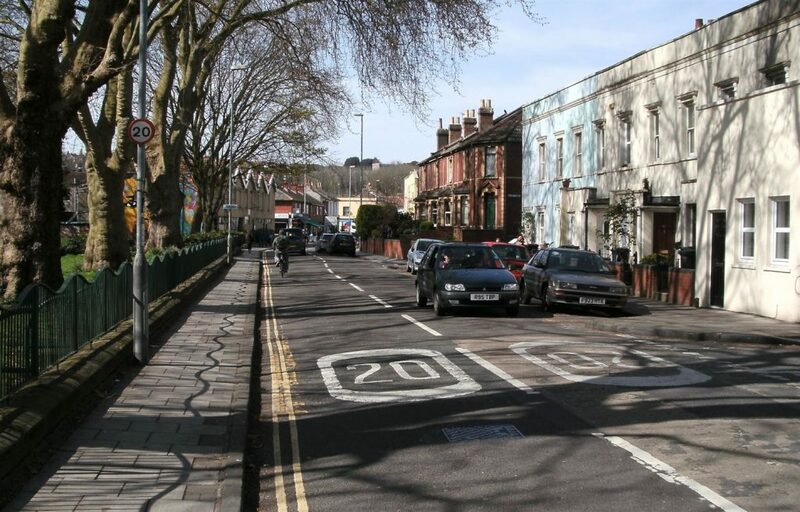 Bristol also makes use of many quieter streets to provide handy cycling routes through the city. 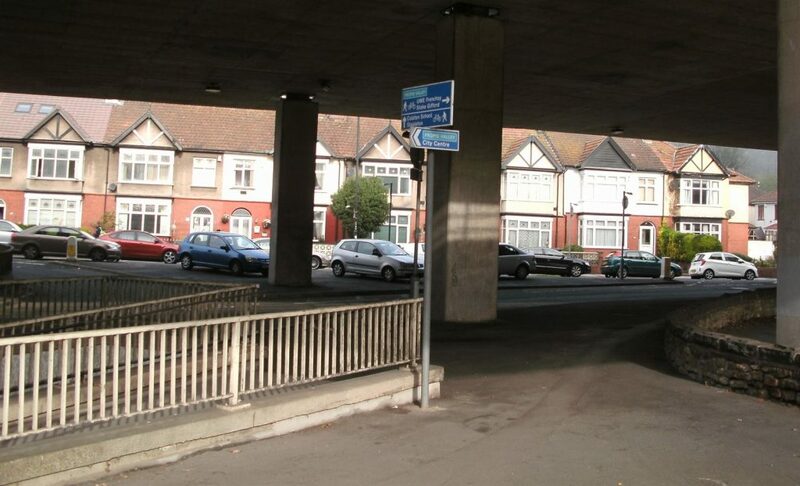 Often they’re made even quieter by restricting motorists from easily going through them (with suitable bike bypasses). For example, there were a lot of one-way streets for motorists where cyclists were allowed to bike both ways; I suspect in some cases they were just legitimising what was already happening anyway. In most of these situations there are just a few signs and road markings to let everyone know what the situation is. With low speed, low volume roads, that seems to be sufficient. 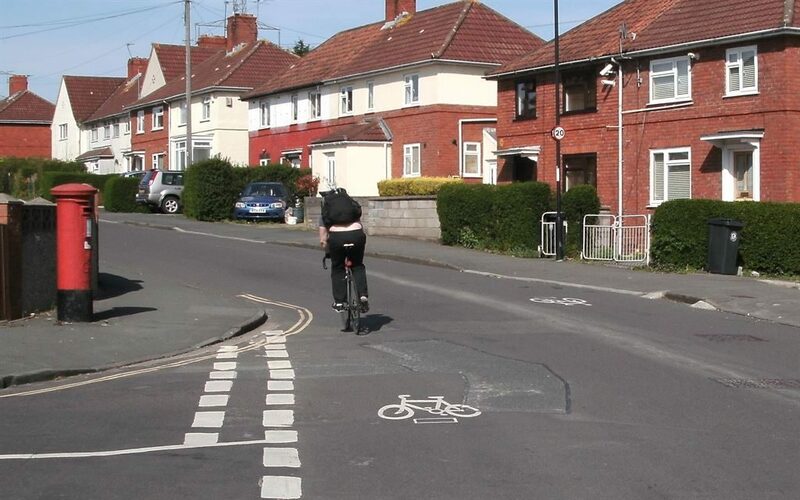 On-road cycle lanes show up on occasion, but were surprisingly rare (and the markings not well maintained). There are some bits and pieces of separated cycleway now popping up (mostly two-way on one side), but so far they are limited to relatively short lengths. They’re certainly welcome but will need a few more bits to join up before there are some coherent links across town. As a newbie, armed with just a standard cycling map, it was interesting to see what it was like to find my way around town (I was staying about 30 minutes from the central city). In the main, there was good, regular signage leading you towards the main destinations (and giving you distances). 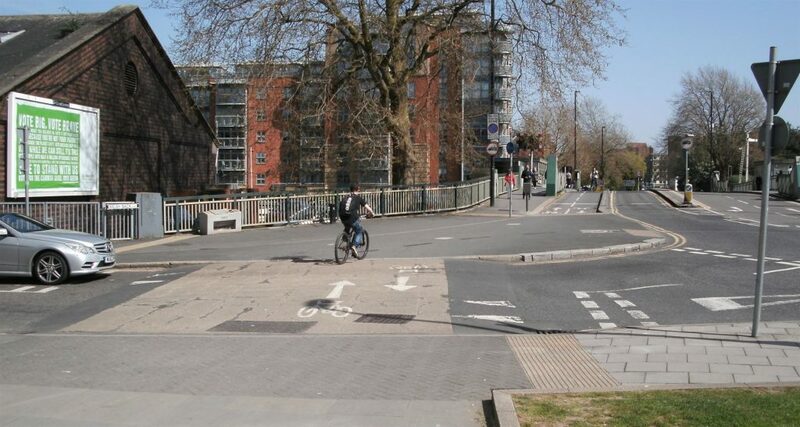 On the main “major” cycleways there was also a colour-coding system, e.g. the Frome Greenway used green rectangles on all signs and markings (although some had faded to a non-descript colour). Despite this, there were still a few places where I got caught out trying to work out where to go to next; it generally didn’t take long to retrace my steps or recheck my map, but I suspect others may get more flummoxed (the hilly terrain and winding roads are quite disorienting). The most confusing area is right in downtown where the signed routes stop and just dump you onto the streets; it takes a few rides to get to know the main ways through (following other cyclists is usually a good fall-back option). Another thing that had just happened before I came to Bristol was the introduction of city-wide 20mph (32km/h) zones on most local streets. The “20’s Plenty” campaign in the UK has been getting growing traction and there are a number of cities that have introduced lower-speed areas, or even whole city zones. The jury was still out about the effectiveness of them in Bristol; while that speed made absolute sense in so many narrow/winding streets, there were still some roads where, without additional treatment, 20mph didn’t feel right (and clearly many of the drivers thought so too). Speaking of drivers though, in the main I’ve been impressed by the level of patience exhibited by most. I’ve been staying on the outskirts of Bristol where narrow country/village roads are the norm, and cars will happily let you tootle along in front of them until there is room to pass (even on some of the busier ones). I can’t think of one instance of being “buzzed” too close while being passed. I suspect that the road environment accounts for some of that; there are so many situations where a narrow road width and on-street parking mean that motorists just have to play nice to each other to get through, and that courtesy also seems to extend to their two-wheeled colleagues too. The presence of cycle symbols directly on the roadway in places also helps to remind them of the other users they share the road with. Bristol’s topography makes it hard to drive anywhere in a straight line and so traffic congestion is fairly rife. While a few plans for ring roads and improved junctions come up now and then, it almost seems like the city has deliberately tried to minimise any major roading works for some time to encourage people to use other modes, including cycling. I have to be careful not paint a too idyllic picture. 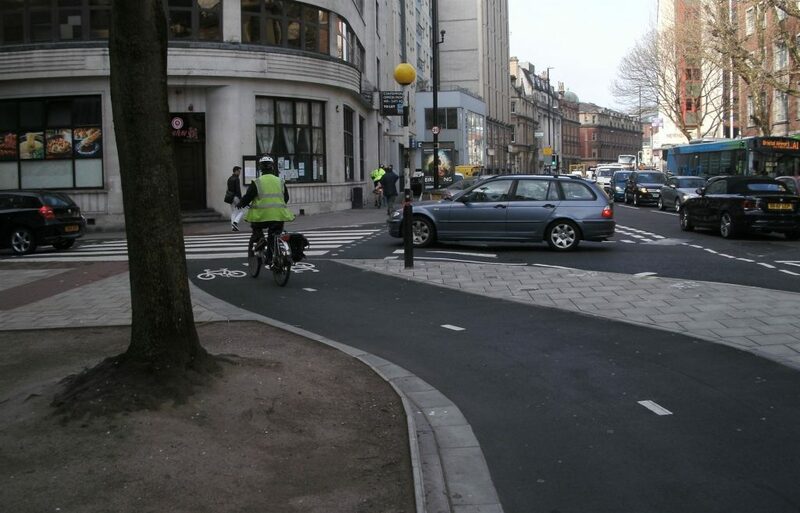 The photos show many of the nice/interesting features that I found around Bristol but, as I’ve stated, there were plenty of missing gaps or just plain annoyances (e.g. ever tried to ride along an entire long cobbled street? Not fun…). Many of the photos of separated cycleways stopped abruptly a bit further down the road. 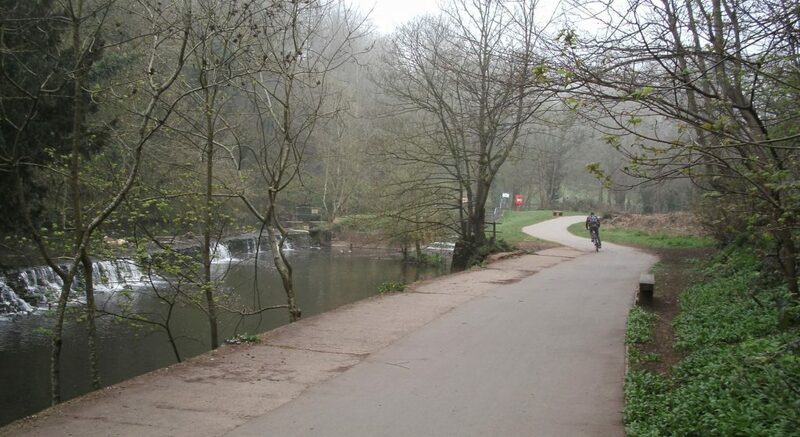 Nevertheless, to date they have made quite an effort here, and there’s a lot to like about biking around Bristol. There’s no shortage of things to take in around Bristol, so I’ll put up some more photos in a separate post. 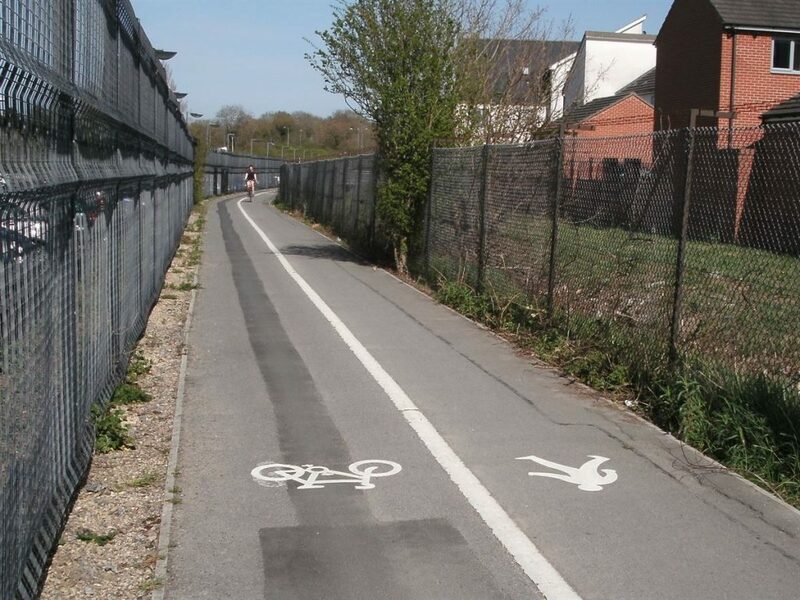 What do you think of cycling in Bristol?